Despite tough competitions from Apple Music or Google Play Music, Spotify is still the best music-streaming service on the market. I’ve used the service for more than 4 years and it only gets better over the years. I love Spotify because it is a cross-platform service that works perfectly on Windows, Mac, iOS, or Android. In fact, you don’t have to pay to listen to music on Spotify because they are offering a Free plan as well. The Spotify’s free tier is ad-supported, that means you will have to hear ads after a few tracks. Besides, there are more limitations when you use the Spotify app on iPhone or Android devices. For instance, you won’t be able to search and play an exact track, and you can only use the skip button a few times per hour. 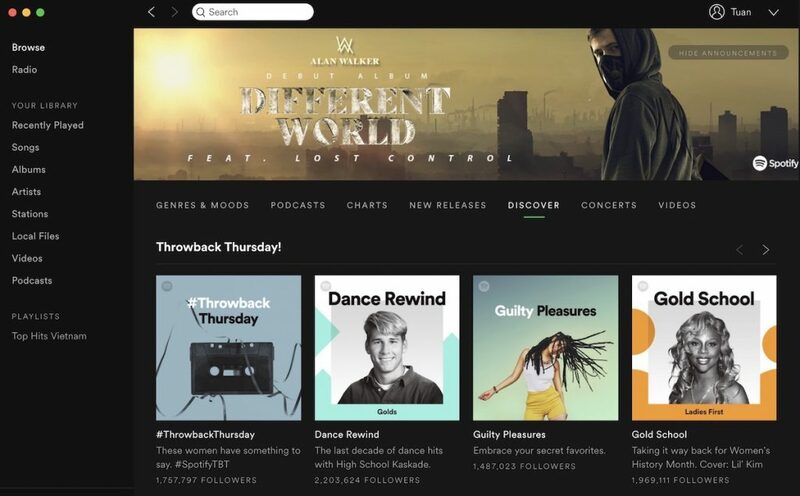 Fortunately, Spotify has some on-demand playlists chosen by its machine learning algorithms and they allows you to play any track with unlimited track skips. I was totally happy with the Free plan but the reasons I changed to the Premium plan is because it offers offline listening and I can turn audio streaming quality from 160kbit/s up to Ogg Vorbis 320kbit/s. Those two upgrades are totally worthy because the music sounds better and I can save significantly on mobile data. At the moment, a Premium account costs $9.99 per month and we also have free access to Hulu’s TV and film content. The Family plan costs $14.99 per month and you can add up to five more people who reside at the same address. TechWalls has a giveaway every month for people who can’t afford to pay for Spotify’s subscription plan. We give away 5 Spotify Premium accounts each month and they are not just regular accounts. They are auto-renewed accounts that you can use in years to come without paying a dime. I will buy a Family account and share it with winners of the giveaway. To join the Spotify giveaway, you just need to subscribe to our Youtube’s channels and follow us on Facebook. Specifically, just follow the steps below. Let us know if you have any questions and you can also join our Netflix Premium Account Giveaway here.